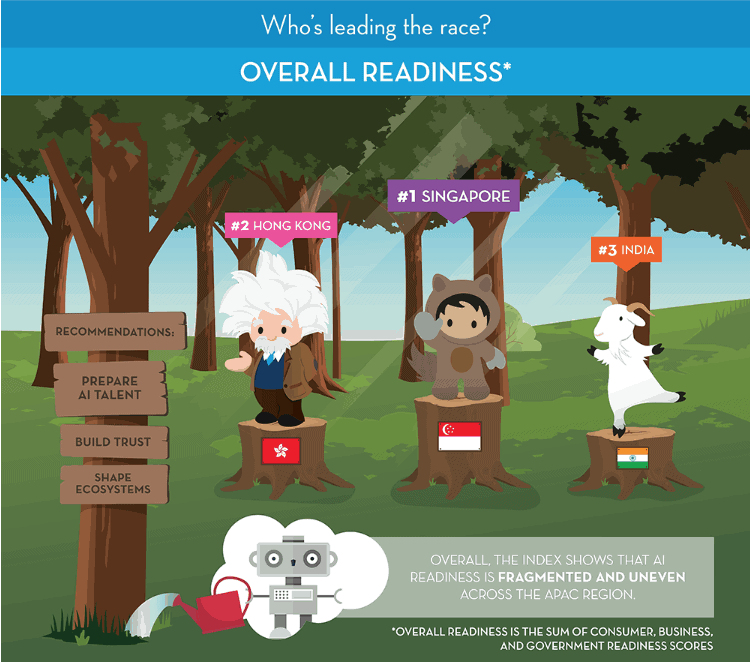 Singapore is leading the Asia-Pacific region in artificial intelligence (AI) readiness, but Thailand takes the lead in consumer readiness for the technology. A report, commissioned by Salesforce and prepared by TRPC, highlighted the benefits and challenges of AI and found that adoption is still fragmented and uneven across the region. "Singapore ranks highest in the overall Index due to one of the region’s most progressive and conducive approaches to AI. From data protection laws to nationwide cybersecurity strategies, Singapore’s institutions have built strong regulatory foundations to maximise the impact of digital technologies on the economy," Salesforce said. The index examined AI readiness in three categories — consumer readiness, business readiness, and government readiness — in Singapore, Hong Kong, India, Australia, Indonesia, Thailand, the Philippines and Malaysia. Sassoon Grigorian, Head of Public Policy and Government Affairs, Salesforce, said there is a need to strengthen AI-specific data protection policies. "The Singapore government must demonstrate its hard-line stance on the misuse or misappropriation of private information. Strengthening both data protection and business certainty in a fast-evolving technological environment is the road to a solid foundation for countering data breaches, ensuring public trust and the continued development of AI," he explained in a media release. His other recommendations include building a regional hub for AI research centers, strengthening skills upgrading initiatives to build a homegrown pool of versatile AI talent, and incentivising creativity and innovation to foster a dynamic AI ecosystem. "Singapore has been successful in attracting businesses to set up regional headquarters that service the rest of the region. A similar approach must be adopted to ensure AI businesses create and grow local AI research centres. This will not only give Singapore a strong foothold in the regional AI value chain, it will give it further the region’s ability to develop a local AI talent pool," he concluded.